My first attempt at printing the heart is pictured below. Unfortunately, my print was unable to finish, so the superior vasculature is not visible. 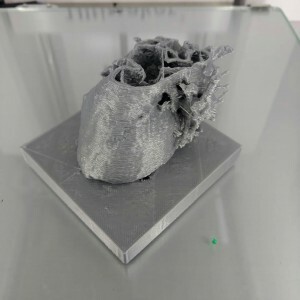 However, the print did successfully print the smaller collateral vessels of the pulmonary arteries. I also need to experiment with printing the heart without the base and instead printing with supports. The base really takes away from the final product in my opinion. I have printed the heart this past week on the taller Ultimaker Extended so I will see next week if the print turned out. It took about 6.5 hours to print the final product. You never cease to surprise me Gwen.. this is truly awesome!! Gwen, this is really incredible! I never expected to be in the same class as someone who could be able to 3D print an MRI scan. I’m interested in seeing your Ultimaker Extended prints and how they turned out without a base!